"Wow, this is a new favorite! I can't believe how easy and how moist and good the chicken tasted. I made it exactly as posted, and my husband and I both loved it. It's in my regular meal rotation now. 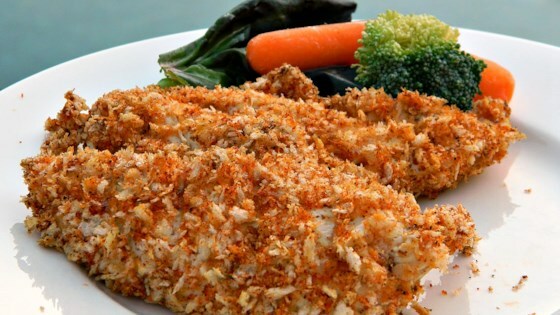 The chicken strips are first coated with a garlic-Dijon mustard mixture, then pressed in a panko bread crumb mixture before baking. The results is moist, delicious chicken with a slightly crunchy coating. Easy and delicious." Preheat oven to 475 degrees F (245 degrees C). Pour 1 tablespoon olive oil on a paper towel and use to coat a cooling rack; place on a baking sheet. Mix mustard and garlic together in a bowl. Combine 1 tablespoon olive oil, panko, paprika, salt, and black pepper in a shallow bowl using a fork. Coat each chicken strip in mustard-garlic mixture; press in panko mixture until evenly coated. Place on the prepared cooling rack. Bake in the preheated oven until browned on the outside and juices run clear, 12 to 15 minutes. An instant-read thermometer inserted into the center should read 165 degrees F (74 degrees C). The Dijon mustard was unbelievably overpowering in this dish. The panko breading was good, but all anyone could taste was salt and mustard. Perfect! Follow exact directions. Do not add eggs! Egg addition is only for the unskilled cook :) Don’t be scared be CONFIDENT in your skill. Added an egg to the dijon/garlic mixture as suggested by other reviewers. BIG difference. Otherwise, the recipe is pretty good!